Not only in the Earth's mantle, in the atmosphere and in the outer layers of the Sun, but also in a chemical reactor, the exchange of heat may not be as effective as originally thought. There, because warm fluid rises and hence induces movement, the turbulent convection can be 100 billion times stronger than in the typical cooking pot. Hot fluids mix turbulently with warm fluids. As the temperature difference between the cold and warm sides increases, the heat transport increases exponentially. When the turbulence is very strong, the exponential growth decreases twofold. Physicists from the Max Planck Institute for Dynamics and Self-Organization, University of California at Santa Barbara, and the French Centre National de la Recherche Scientifique in Nancy report this discovery in the current issue of New Journal of Physics. The long standing theory for turbulent convective heat transport from 1962 had predicted that the exponential growth would increase. Now, the theory will need to be reconsidered. 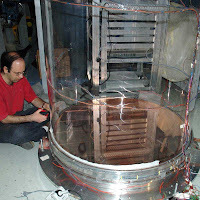 In some respects the experimental apparatus of Eberhard Bodenschatz and colleagues is similar to a gigantic pressure cooker - even if the Director at the Max Planck Institute for Dynamics and Self-Organization calls it (due to its shape) the "Göttingen submarine". In the hermetically sealed submarine, a two-metre high container of one-metre in diameter is heated from below and cooled from above. In-between, a pressurized gas is mixed by turbulent convection, where hot water rises from the hot plate and sinks from the cool one. The main difference is that the convection in the "Göttingen submarine" is a million times stronger than in a cooking pot. With this, the scientists want to learn about turbulence in the Earth mantle, in the atmosphere and in the outer layers of the Sun, where the convection is yet another 100,000 times stronger. "We have measured the heat transport of very strong convection and found that it is completely different from what we expect on the basis of previously established theory", says Eberhard Bodenschatz. The stronger the turbulence mixes the hot and cold gas, the stronger the heat transport from the hot bottom to the cold top will be - in essence the heat transport increases exponentially. The team measured this increase and found, surprisingly, that the exponent in the law decreases by the power of two. For a given temperature difference, not only one but two states were observed; once where the exponent falls from 0.308 to 0.253, and, sometimes, for a second time to 0.17. In 1962, the American physicist Robert Kraichnan predicted that the exponent should increase from 0.3 to 0.4 and then should be almost constant in this ultimate regime of thermal turbulence. "In the meantime we have conducted more measurements at the highest turbulence levels and found yet another state with possibly another exponent" says Eberhard Bodenschatz: "This time it may be the predicted Kraichnan regime. The multiplicity of states and the exponents baffles us, as the physical processes are yet to be understood". To understand this better let's take a closer look at the "cooking pot" in the submarine. At the bottom and top plates, the heat is conducted through a few hundred micron thick thermal boundary layer into the gas. Here, a thermal plume develops which carries hot or cold gas into the interior of the vessel. It is well known that plumes of this type form a lava lamp - for yet unknown reasons however, rising and falling plumes merge to create one large circulation that flows up one side and falls on the other. According to Kraichnan's theory, this circulation should lead the boundary layer to become turbulent. From this point on, the heat conduction should increase more rapidly. "Instead the efficiency decreases and we find two states instead of one" says Eberhard Bodenschatz: "Somehow the boundary layers are changing, but we do not know how". To investigate the heat transport in a planet like Earth or a star like the Sun is ultimately difficult. Even if scientists only want to investigate the turbulence itself, the conditions are difficult to achieve in the laboratory. Therefore the known experimental data are very limited. "Recently, with the submarine we were able to reach very high turbulence levels by using a two metre high container and sulfur hexafluoride (SF6) at 20 times atmospheric pressure" says Eberhard Bodenschatz. The experimental data from Guenter Ahlers, Denis Funfschilling, and Eberhard Bodenschatz poses a riddle that will challenge theorists and experimentalist alike. The international team is already on its way to designing an experiment that can resolve the fine scales of the boundary layer. Results will give deeper insights into convective processes in the Earth, the atmosphere and the Sun, as well as the potential to optimize heat transfer in industrial reactors.